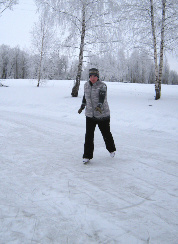 Skating remains very popular sport in which with pleasure are engaged both adults, and children. If you still even didn’t think of joining number of his fans, never late to make it. To skate, as well as to dance, it is possible to learn at any age. Besides, that skating forces to move and be more in the fresh air, it improves a bearing, coordination, possession of a body, does movements more plastic and more expressive.